From the noted California plant breeder Albert Etter in 1944. Bright pink flesh; light pink blossoms. The fruit is crisp with a sweet/tart flavor, conical shape; skin is a creamy pale green. Parent is red-fleshed Surprise. This apple was the Etter Surprise hybrid singled out for patenting and official introduction in the mid 1940s. Good flavour but is very tart for a dessert apple; almost a cooker. More details on Nigel's website. I planted Pink Pearl last year and was delighted to get a few fruits. The flavor and texture is sweet tart and crunchy. Love it! I am really looking forward to see how many I get this year (looks to be a better apple year). I live in the sunbelt in a coastal micro-climate and so far my tree has not had any problems. I plan on planting another one next year so I can have all the pink applesauce and cider want. Yum! This cultivar bears fairly large fruit with pale yellowish skin and bright rose flesh. The flavor is awesome - tart and sweet with a bit of tannin if picked early (before yellowish-pink blush on fruit develops). It requires regular watering during the summer at my location, a valley 50 miles from the coast with a cool Mediterranean climate, on a south facing hillside with relatively thin soil. It is vigorous cultivar, somewhat prone to scab. I am planning to plant another row on seedling rootstock. Lovely apple, inside and out. Tart with just enough sweet to be refreshing--like a sweet lemonade. Bought it for the novelty but would buy it again for the great flavor. 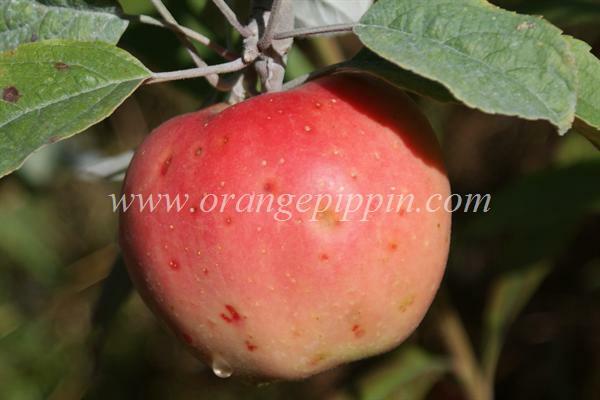 We enjoy this very tart small apple for its flavor and intense hot pink flesh. It is in a cool coastal zone and moderately infected with apple brown spot each year and we must spray with horticultural oil several times.